In my investing experience and my interaction with various investors, I see a lot of people getting very excited and overwhelmed when a listed business offers bonus shares or splits the shares. Some are carried away without actually understanding the basis or the concept. I actually get a lot of emails asking whether a business can be bought since it is going for a split or offering bonus shares. Today, I would like to present a good perspective about the two and the difference. Once this is properly understood, all of us can take an informed decision and try to put the pieces together. Before we move ahead, please read the following articles, if you have not yet read them. This is important for some terms which Ill be using in this article. Alright, lets understand the Bonus issue first. When a business offers shares to others, the understanding is that, the profit and loss will be borne by investors as well (in terms of market price). Whenever there is a surplus earnings which a business makes, the patient investors get rewarded with a small part of the earnings called dividends. The rest is kept as reserves and shown in the balance sheet as well. Many companies choose to keep the entire earnings with themselves and let it grow over a period of time. This accumulates over a period of time and finally the company decides to distribute a huge chunk. Instead of doing this in terms of dividends, the businesses decide to expand their authorized share capital by increasing the number of shares. What this essentially means is that the company converts a part of their reserves into shares. From my previous articles, I am sure you understand some basic terms. Let's try to put the above understanding in terms of an example. Lets say that a company has issued 1 Lakh shares to the public at Face Value 10. Lets say that the reserves are 10 Lakh. The company wants to increase its share capital. Now, for a FV of 10, the number of shares for reserves of 10 Lakh is 1 Lakh shares. So now, in addition to the 1 Lakh shares in the market, we have 1 Lakh shares created out of reserves. This means that for every share the company has given, there is one bonus share. This comes out as 1:1 bonus issue. Now, there will be 2 Lakh shares in the market. Now since the number of shares have doubled, the market price would halve. Essentially, please remember that market price would not change in terms of value since nothing has changed in the company in terms of its business. So, even though the number of shares have doubled, there would be no increase in the value of the holding in any way. If the market price of the share was Rs 100, after the bonus issue, it would be at Rs 50. Market cap has no effect. Now lets understand the stock split. A company's market price depends on its profitability, sustainability and future vision. As a company keeps outperforming, its market price goes up and up. There are so many companies like MRF, Eicher, Page etc which trade at a very high price. For eg, as I write this article, MRF is trading at around Rs 38000 with a Face Value of Rs 10. Lots of retail investors cannot afford to buy even 1 share of MRF since it is quoting at such a price. If an investor wants to start a SIP at Rs 10000 per month, he will not be able to buy a single share of companies trading at above Rs 10000. To help all investors to participate and own shares in a business, companies go for a stock split. A stock split means splitting the stock into multiple smaller units of lesser Face Value, so that the liquidity increases. If a company has 1 Lakh shares of FV 10 and is trading at Rs 20000 and decides to split the shares into 5 parts, we will have each share of Rs 4000. So even though the new market price becomes Rs 4000, the value doesn't change. I hope you are understanding the difference between value and price in this article as well..
Lots of punters use these opportunities to artificially raise the price and many poor investors get excited by the bonus/split news and get stuck at high levels. With a good understanding, this can be avoided. Now with this understanding, you will be able to analyze things in a more mature way. You will not be carried away by any of these. You need to understand that, by giving a bonus or split of shares, nothing really has changed. Everything depends on how the company performs and that's all matters. Please remember that Market cap is a function of future profits and trends and since nothing has changed, it would remain same. Think about it :-) Any experiences?? Good, bad, ugly?? Let us know.. In both the cases, though there is no impact on value of holding, why people get excited? Why price rallies before ex date? As I mentioned in my article, the hype is always short lived and the stock will eventually trade in its value zone. Punters make use of this hype to take the stock up and eventually it will retrace. 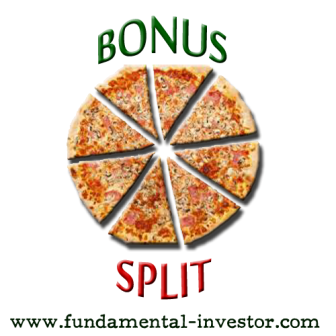 Once we understand the concept of bonus and split of shares, we can make a better judgement. Hope this clarifies. Sir,When shares are split, don't u think the shares prices seems cheaper and shares can be demanded even by those who are unable to afford same earlier...so I feel that the prices of shares will increases as there as accelerating demand for the same. Dear Siddhu. As I mentioned in the article, the main reason for a share split is to make the share price affordable to investors. So, if shares are split, it might look cheaper, but the Face Value has changed and hence, the value is the same. If a share was Rs 10000 at FV 10, it becomes Rs 5000 at FV 5. In other words, a share trading at Rs 10000 (FV 10) is same as Rs 5000 (FV 5) since the number of shares have doubled. So, now, it doesnt mean that the price will go back to 10000 unless the company performs in the future and it moves up. Now, even if it starts moving up because of hype, it will only be short lived and will come back to its real valuation price. I hope you are getting the point :-) Please feel free to ask more questions. Thanks. Recently there was an article about a man holdinh 100 Wipro shares of 10,000 which went on to be of 535 crore worth all because of bonuses and splits. How is it possible when bonus and splits do not actually impact the market cap as per this article. Dear Rahul ji.. I am not saying that Bonus is not a positive thing. Ideally, when a company gives a bonus, that means their reserves are getting distributed. Instead of paying dividends regularly, a company can give bonus shares when their reserves get accumulated. Now, in the case of Wipro, the wealth got increased not by the bonus, but by Wipro's consistent performance. Wipro had to perform and show growth and people always pay for a company's increasing profits and revenues. After Wipro issues bonus shares, if they had not shown growth in their operations, this kind of wealth could not have been created. I hope you are getting my point. Please feel free to ask more questions. Bonus needs surpluses equal to the no.of of bonus shares multiple by face value of a share. Where as split need not any surpluses. Dear Safee. After a bonus is given, the reserves/surplus will become lesser since the money from reserves/surplus is only converted into Bonus shares. Can the company use money in reserve & Surplus to pay debts . or can it use it to buy assets, or use it for Working capital or pay Dividends in future. Instead of giving Bonus why dont they give Dividend with the Reserve & Surplus money. Dear Radhe ji.. It is upto the company to use their reserves as they wish. As I have explained in my article, Dividend or Bonus is a way of rewarding shareholders with some cashback. Some companies pay regular dividends and hence that won't be available in reserves. In other cases, if dividend is not paid regularly or if reserves are very high, the money in reserves can be given as bonus shares to shareholders. Either way, shareholders are benefited but value of company doesn't change in either scenario :-) Hope this is clear. Feel free to ping for more queries..
Dear Melony. Thanks for your observation. Actually my site works best with Chrome only. With IE I am facing issues mainly in the HTML scripts which I write for the Scrollers etc. I might have to live with it I guess. Sorry about that. If bonus issued and share price is halved, what monetory benefit do existing investor get?